20 November 2017, United Nations Conference Centre, Addis Ababa: Today, Ethiopia joined the global World Children’s Day celebrations by giving children high profile roles to become champions of their rights. In line with the event’s theme ‘For children, By children’ child parliamentarians took over the roles of the Ministers of: Women and Children’s Affairs; Health; Education; Water, Irrigation and Electricity; Labour and Social Affairs; and Urban Works and Construction. In addition, children took over the roles of the Attorney General and UNICEF Representative. In their new roles as ‘shadow Ministers’, children shared their ideas on issues that affect their lives. Include children’s voices when adults and local authorities discuss issues that affect children’s lives. Child parliamentarians from different regions also had an opportunity to discuss issues relevant to children in Ethiopia with shadow Ministers and dignitaries through a Q&A session. 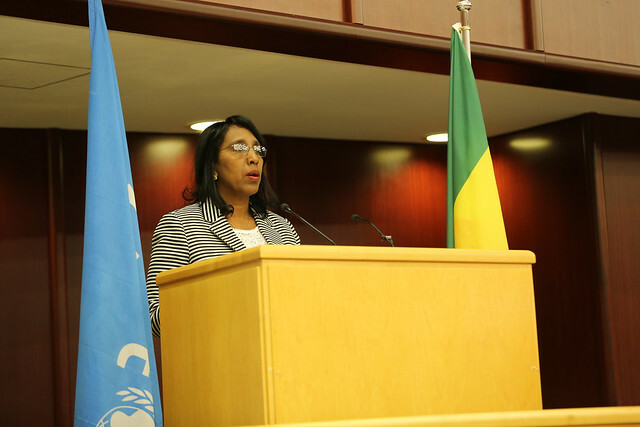 In her opening remarks, H.E Ms Demitu Hambisa, Minister of Women and Children’s Affairs, stated that this year’s World Children’s Day is a day of action for children by children. She highlighted that decision makers need to ensure that children’s voices are heard and reflected in decisions that affect their lives. In addition, UNICEF Ethiopia launched its publication ‘Hulem Lehisanat- Always for children’ depicting its 65 years history serving children and women in Ethiopia. 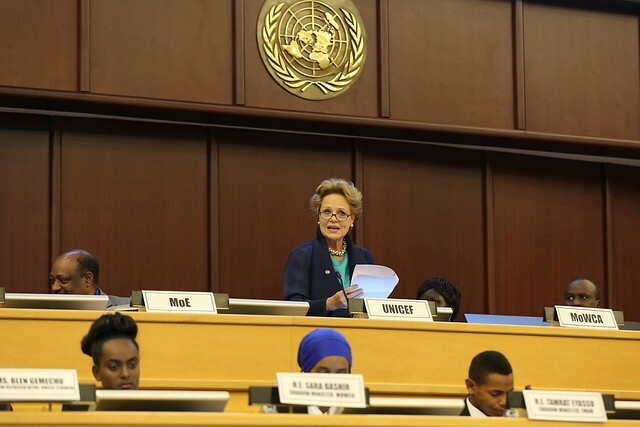 The event highlighted the importance of including children’s voices by providing children with an opportunity to share their own solutions on how to keep every child in Ethiopia healthy, well-nourished, in school and protected. 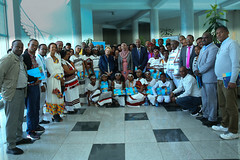 ADDIS ABABA, 24 July 2015 – Today, UNICEF’s Media and External Relations Section has organised the third media get-together with UNICEF National Ambassadors to Ethiopia – Hannah Godefa and Abelone Melesse. Also present on the occasion as guests of honour were the fathers of Abelone and Hannah- Ato Solomon Melesse and Ato Godefa Assegahen respectively. 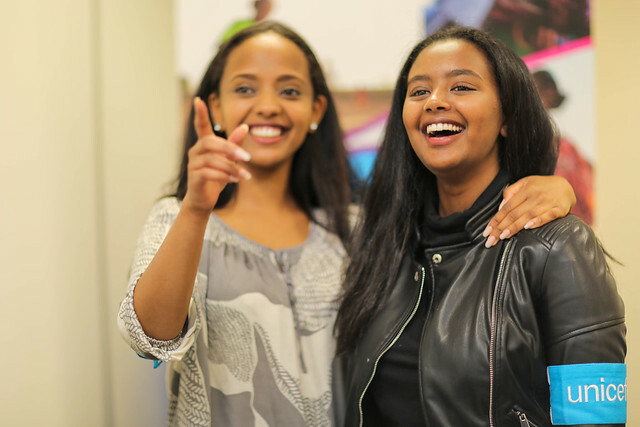 Since their appointment as UNICEF National Ambassadors, Hannah and Abelone have shown a true commitment to the issues of women and children by involving in different advocacy activities both in Ethiopia and abroad. At the media get- together, both Hannah and Abelone shared their current activities in relation to the rights of women and children including their recent field visit to Amhara region to see UNICEF- supported child protection and health activities. At the occasion, the media had the opportunity to ask questions to Abelone and Hannah on their role as ambassadors, their inspiration and their future plan. The media also forwarded their questions to their fathers on how they have raised their daughters and how they support them. Seventeen year old Hannah became a UNICEF National Ambassador in 2013. This year, Hannah has participated at the World Education Forum 2015 (WEF) from 19 to 22 May in the city of Incheon, Republic of Korea. Hannah joined the “Leaving no one behind – how education can drive inclusive development?” panel co-hosted by the UNICEF Executive Director and David McKenzie of CNN. On 16 June, Hannah became a panelist or the 29th session of the Human Rights Council’s panel discussion on girls’ education held in Geneva. 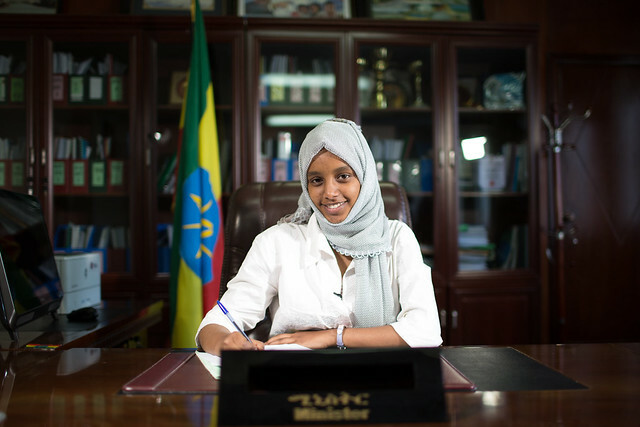 Nineteen year old young rap star Abelone Melesse became a UNICEF National Ambassador to Ethiopia in 2014. This year, Abelone has attended a number of meetings and conferences in her new capacity as an Ambassador. On International Women’s Day, Abelone was invited by Ethiopian Women’s Association in Norway joined by high level Norwegian politicians where she had the opportunity to deliberate a speech and perform her songs on behalf of the women in Norway and in Ethiopia. Abelone also officially released her new single entitled “Jewels of the world” – a song which she has dedicated to UNICEF at the 25th anniversary of the Convention on the Rights of the Child. The song written by Abelone herself has received more than 10,000 views on Youtube 7,150 views on Facebook and 70,106 views on DireTube. In addition, the Media and External Relations Section facilitates individual interviews with specialists and experts on different programmes in different languages including: English, French, Arabic, German, Swahili, Dutch, Italian and many Ethiopian local languages. We also organise media round tables with senior staff and programme specialists, respective government officials and partners on different topics affecting women and children. Regular media field visits will continue to be organised to visit UNICEF-supported project sites in Addis Ababa as well as in the regions. We wish to thank those who were able to join us and look forward to our continuous collaboration in 2015 and beyond. 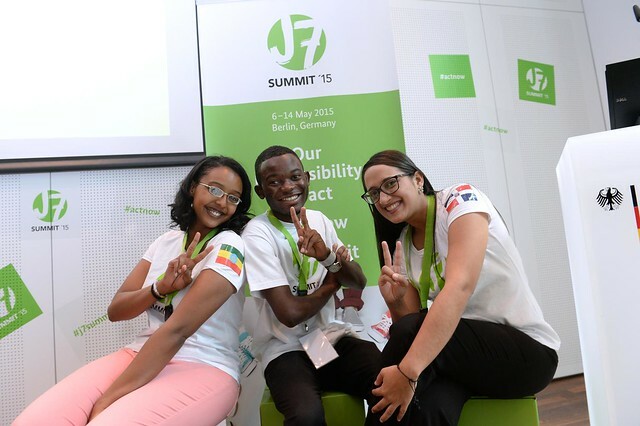 BERLIN, GERMANY – The J 7 Summit 2015 is an opportunity for 50 young people from all over the world to come together to discuss and express their ideas on the most pressing issues for the upcoming G7 negotiations in June. I was one of the lucky ones to have the privilege of participating in this summit as the Ethiopia representative during my internship at UNICEF Ethiopia. Topics such as: protecting our planet (protection of the marine and resource efficiency); building a healthy future for all (antibiotic resistance and fighting pandemics, neglected and poverty related diseases); empowering women and girls (empowering women in self-employment and vocational training); fair economy (retail and supply chain standards) and ACT NOW (youth involvement) were discussed in detail. In relation to the issue of neglected and poverty related diseases, suggestions were made with an objective of eradicating poverty related diseases. Creating public awareness was one of the suggestions put forward. With this, there should be an increase in public education as well as in funding. These donations can purchase vaccinations and fund infrastructural solutions. Other suggestions by the youth of the world include increasing pharmaceutical research and developing new drugs, providing education for all and creating an organization with the explicit goal of eradicating neglected diseases. After presenting our papers to German Chancellor Angela Merkel, we had a lively discussion, during which she stated that leaders of developed countries should also help and work with developing countries to eradicate poverty related diseases once and for all. The Chancellor also mentioned that everyone has a right to a full and healthy life, regardless of where they come from. Chancellor Angela Merkel was very impressed with the suggestions we made and acknowledged that the whole point of the J7 Summit was to include youth in decision making. We also had the opportunity of going to all G7 countries embassies and the European Union to present our position papers so as to enable us to work together and see what can be done to involve more youth. One way of doing this was to make use of different social media interfaces such as Facebook and Twitter to better keep in contact, involve other youth to take part and spread our position papers to the rest of the world. We, the youth, have also promised to follow up on the G7 Summit and see if our suggestions have been included. 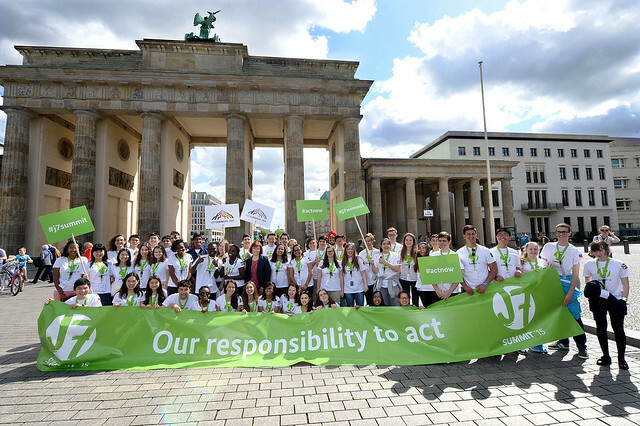 But the J7 Summit wasn’t only about work; it was also a chance for us to see historical places in Berlin such as Brandenburg Gate and the Wall of Berlin. We had the pleasure of listening to the Berlin Philharmonic Orchestra and took part in different sport activities to keep ourselves active and refreshed. Personally, this experience has been an unforgettable journey. It gives me so much hope to see so many people and organizations willing to listen and work with the youth. I am grateful to UNICEF Ethiopia for choosing me to represent my country at the summit. 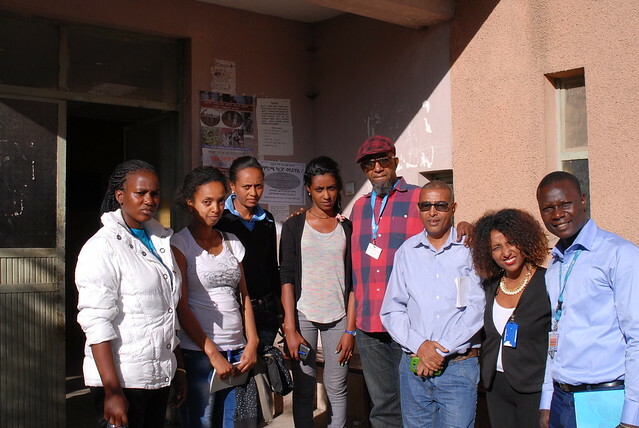 27 January 2015: UNICEF Chad’s Youth Advocate, 16 year old Mani Virgille Djelassem, and UNICEF Ethiopia Supporter- Tommy T. Gobena visited the Addis Ketema Youth Centre and its HIV prevention activities today. The Chadian National Council for the fight against AIDS, in collaboration with UNICEF Chad, nominated the 16-year-old Mani as a National Youth Advocate to intensify the communications activities around the issue of HIV/ AIDS among youth and adolescents. Her appointment was officially presented by the First Lady of Chad, Mrs Hinda Deby, during the celebration of World AIDS Day on 1st December last year. Tommy T. Gobena, a bass player in ‘Gogol Bordello’- a renowned international rock band- has been closely working with UNICEF in conveying messages on HIV/AIDS prevention. Tommy’s public service announcement (PSA) entitled “Your life; Your decision” produced by UNICEF in collaboration with the Federal Ministry of Health (FMoH) and UNAIDS has received extensive public viewers and positive feedback on social media after its release on World AIDS Day last year. The duo observed the Addis Ketema Youth Centre’s youth activities, including the library, cafeteria, Voluntary Counseling and Testing and game centres, and met with young beneficiaries. While discussing the issue of HIV/AIDS, Tommy and Mani highly encouraged them to get tested and know their HIV status as early as possible. ”The sooner you know your HIV status, the more options there are available to you.” said Mani. “You can prevent infection to others if you find out you are HIV positive and you can seek medical care early and live a healthy life. If you test negative, you can continue to protect yourself from the virus by avoiding risky sexual behaviour,” reiterated Tommy. Tommy and Mani also had the opportunity to meet with the Director of the Disease Prevention and Control Directorate at the Federal Ministry of Health, Dr Mahlet Kifle, and the HIV Team Coordinator, Dr Frehiwot Nigatu. “I highly encourage adolescents in Ethiopia to be a champion for change and share their knowledge about HIV with each other.” said Mani. In Ethiopia, the prevalence of HIV in terms of percentage of the population is low compared to other African countries. In 2011, 1.5 per cent of the population between the age 15 and 49 was HIV positive. In 2005, this rate was 1.4 per cent. However, taking into account the large population, the absolute numbers of people infected with HIV is high. Young people are often at a greater risk to become infected with HIV. They may have shorter relationship spans and therefore more sexual partners, or they may engage in risky sexual practices. Girls face a higher risk of HIV infection than boys. In 2011 DHS report, 0.2 per cent of adolescent girls (aged 15-19) were HIV positive compared to 0 per cent of boys. This rate has declined since 2005, when this rate was 0.7 per cent of girls and 0.1 per cent of boys. 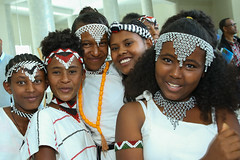 ADDIS ABABA, 4 June 2014 – Today, the Royal Norwegian Embassy in Ethiopia announced a NOK 100 million (USD 17,421, 026 ) grant to support the joint UNICEF and UNFPA programme on ‘Rights-based Approach to Adolescent and Youth Development in Ethiopia (Phase II – 2014-2017)’. 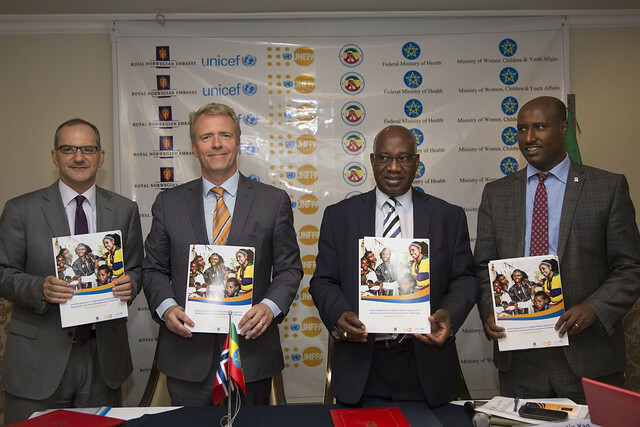 The fund is divided equally between UNICEF and UNFPA and released independently to each agency on a bi-annual basis. Under the programme, vulnerable adolescent girls and boys will gain improved access to an integrated youth-friendly services on protection and promotion of rights related reproductive health services, HIV/AIDS prevention services, and livelihoods. 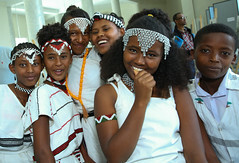 The funding will benefit 403,000 adolescents and youth aged between 10 and 24 in 30 selected woredas (districts) of six regions (Amhara, Oromia, SNNPR, Afar, Tigray and Addis Ababa City Administration). This joint programme will be implemented in partnership and with active collaboration of various government and non-government partners. The Federal HIV/AIDS Prevention and Control Office (FHAPCO) and key sector ministries: Health, Education, Labour and Social Affairs and Women Children and Youth Affairs will play a pivotal role at all levels of the programme implementation. Furthermore, civil society organizations (CSOs), and community based organizations (CBOs) will be active implementing partners. The joint programme aims to improve the capacity of government and non-government institutions as well as youth-run organizations to fulfil the demand of adolescents and youths in the selected 30 woredas. It will also empower communities and parents to ensure a protective and enabling environment which includes protecting them against gender-based violence, Harmful Traditional Practices (HTPs) and violation of their reproductive rights. In line with rights-based programming approach, disadvantaged adolescents and youth are recognized as key actors in their own development utilizing Sexual Reproductive Health (SRH) and HIV/AIDS prevention services rather than as passive recipients of information, skills, and services. Building on the experiences gained from the previous joint programme (2007- 2013), the phase II joint programme will provide services on SRH and HIV/AIDS services through youth centres, health facilities, and educational institutions so that adolescents and youths can ultimately make healthy decisions for themselves. 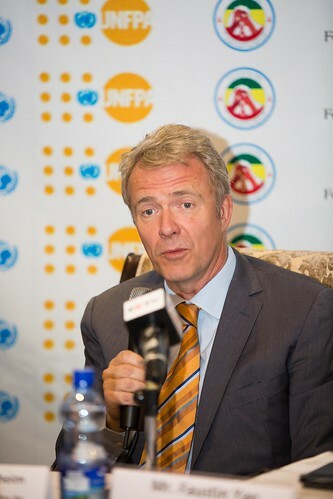 “We commend the Royal Norwegian Government for supporting the Government of Ethiopia, UNFPA and UNICEF to sustain the gains made so far. 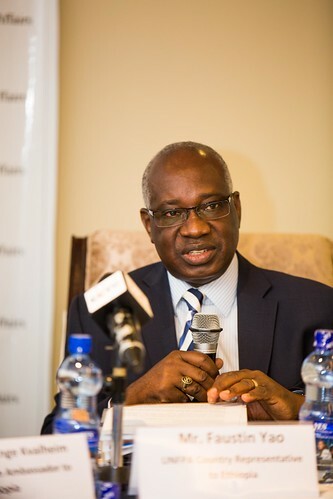 UNICEF is firmly committed to enhance the development and protection, care and support of adolescent and young people,” said Dr. Peter Salama, UNICEF Representative in Ethiopia. What: Grant signing of NOK 100 million (US$ 17,421, 026) from the Royal Norwegian Embassy to support the joint UNICEF and UNFPA programme on rights-based approach to adolescent and youth development in Ethiopia (Phase II – 2014-2017). When: Wednesday 4 June2014, time 9:30am. Where: Elilly International Hotel, Addis Ababa. Who: H.E. Mr. Odd-Inge Kvalheim, Ambassador, Royal Norwegian Embassy in Ethiopia; H.E Ato Berhanu Feyissa Director General, Federal HAPCO, Dr Peter Salama, UNICEF Representative to Ethiopia; Mr. Faustin Yao, UNFPA Representative to Ethiopia. Why: About 33 per cent of Ethiopian population are aged 10-24 years, with nearly 22 per cent being adolescents aged between 10 and 19 years. Young people, in particular female youth, continually face risks such as poverty, HIV/AIDS infection, domestic violence, sexual harassment, and harmful traditional practices. To complement government’s efforts in addressing adolescent and youth issues, the joint UNICEF and UNFPA programme provides an integrated youth-friendly services on protection and promotion of rights related reproductive health services, HIV/AIDS prevention services, and livelihoods. National Youth Policy Implementation Status Assessment, MOWCYA in collaboration with UNICEF and UNFPA, December 2012, AA. TERGOL, AKOBO WOREDA (GAMBELLA REGION), 15 March, 2014- As the searing heat of the afternoon sun begins to ease, a group of women carrying jerry cans and plastic buckets start to descend into a small compound where they have access to clean water from two water points. The small compound is one of two sites where UNICEF has installed two emergency water treatment facilities (EMWAT kits) through its implementing partner, ZOA International, in Tergol town, in the Akobo district of the Gambella region, western Ethiopia. Tergol is a small town by the Akobo River that marks the border between Ethiopia and South Sudan. Tergol has been under the spotlight since mid-December last year after thousands of South Sudanese asylum seekers crossed over into the town after being displaced by conflict in Africa’s youngest nation. According to UNHCR, close to 66,000 asylum seekers crossed into Ethiopia by the beginning of March 2014. Akobo has received 34 per cent of this number, which is the second largest arrival rate after Pagak where 33,000 South Sudanese civilians displaced by conflict have entered. These asylum seekers are in a critical situation and need immediate humanitarian assistance including the provision of clean drinking water and sanitation services. In Tergol, the host community has entirely depended on the Akobo River for its water needs as there has never been a facility to provide safe drinking water. However, this situation has been recently improved. With UNICEF’s support, EMWAT kits have been built and are now supplying clean drinking water to the Tergol community as well as to the thousands of South Sudanese asylum seekers. Water from the nearby river is purified and supplied by the first reservoir built by the emergency kit, the purified water is then transferred into a second reservoir where it is chemically treated before it is reticulated to the water access points. Each EMWAT kit has a capacity for providing 20,000 litres of clean water and the kits can be re-filled every two hours depending on the rate of demand. Nyathak Minyjang (with black dress) comes to the water point at least three times a day. She fetches water for cooking, bathing and drinking. 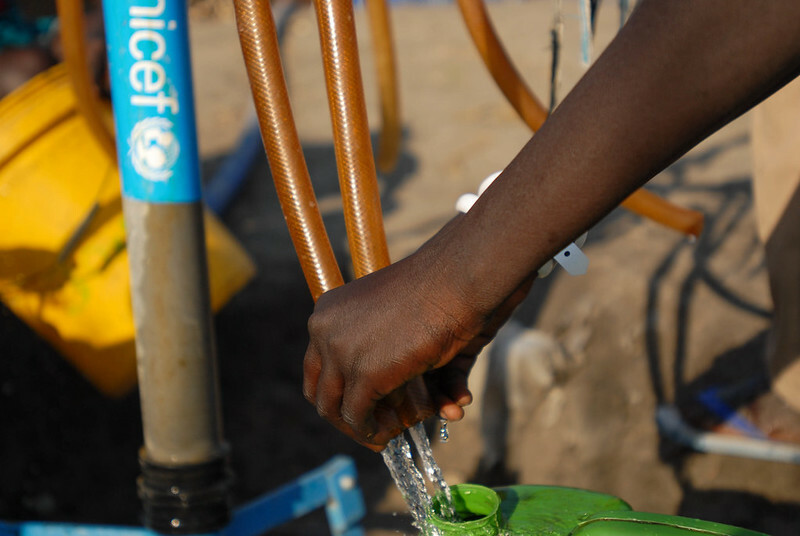 The emergency water treatment facility which is built with the support of UNICEF provide clean drinking water to South Sudanese asylum seekers and the host community in Tergol ©UNICEF Ethiopia/2014/Bizuwork. While the women gather around the water points, they talk to each other as clean water fills their buckets and jerry cans. The women then help one another to balance the vessels on top of their heads. When it is Nyathak Minyjang’s turn, a 25-year-old mother of four, she places her plastic bucket under the tap and holds the hose down to pour in the clean water. Prior to the response, Nyathak had lived on the South Sudan side of Akobo before coming to Tergol with her four children. Her only previous access to water was a river. She never imagined that she would have access to clean drinking water from a tap. “We used to drink water from a river. My children would regularly get sick and I would get sick too”, she says. “The quality of the water here is very nice.” Nyathak comes to the water point at least three times a day. She fetches water for cooking, bathing and drinking. Most importantly, she applies the lessons she learnt about personal hygiene from community hygiene promoters. She is also keen to keep her children clean. Nyarout Gazwech, a 21-year-old mother of two boys, is also very happy about the supply of clean water. She came from the South Sudan city of Malakal a month and a half ago, leaving her two brothers and her mother behind when the conflict intensified. During her long trek to Tergol, she and her children had no option but to drink unsafe water. “My children were having diarrhoea after drinking the river water. Here we have clean water and my boys will not get diarrhoea again,” she says. UNICEF in partnership with UNHCR, the Government Administration for Refugee and Returnee Affairs (ARRA), the Gambella Region Water Bureau, and its implementing partner ZOA supports the provision of safe water to the host community and asylum seekers in Tergol. UNICEF’s response has followed its Water Sanitation Hygiene (WASH) strategy by increasing equitable and sustainable access to safe water and basic sanitation services, as well as promoting improved hygiene in Tergol. “We are providing clean water to the asylum seekers and to the host community. Furthermore, we teach them about safe hygiene practices such as the importance of hand washing and using latrines,” says Nigussie Yisma of ZOA who is coordinating the WASH interventions in Tergol. 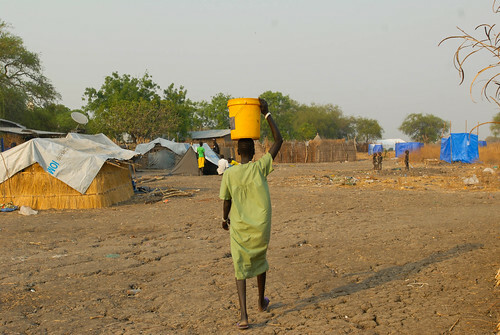 Apart from Tergol, UNICEF also supports WASH interventions at the entry point in Pagag and in the Lietchor refugee camp. One EMWAT kit has been installed at the Pagag entry point and is providing clean drinking water to the asylum seekers and the host community. Similarly, five shallow water wells have been drilled in the Lietchor refugee camp to increase access to a sustainable source of clean water for the refugees. Moreover, water purification chemicals and emergency sanitation facilities are being distributed while hygiene promoters continue teaching the community and asylum seekers about safe personal and environmental hygiene practices. When the emergency response was launched in January 2014, community hygiene promoters were trained and they taught the community and asylum seekers about the benefits of safe hygiene practices. Furthermore, 40 communal latrines have been built in close proximity to the host community as well as where asylum seekers are staying. In order to keep the facilities running smoothly, local water technicians have been trained on the management and maintenance of the water facilities to safeguard smooth operation. The water technicians are responsible for regularly monitoring the water levels and the quality of the drinking water. Water purification chemicals and accessories are also readily available to the community. Clean and safe drinking water is essential for life and is also bringing renewed hope for people like Nyathak and Nyarout after being displaced by the conflict in South Sudan.